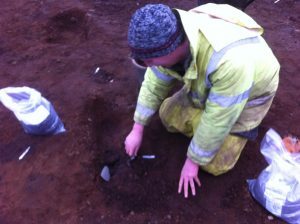 The earliest domestic pottery vessels found on the Carnoustie site are early Neolithic carinated (shouldered) bowls from c. 5500 years ago. They have curled over rims, and shoulders which divide the rim and neck from the belly and the rounded base. 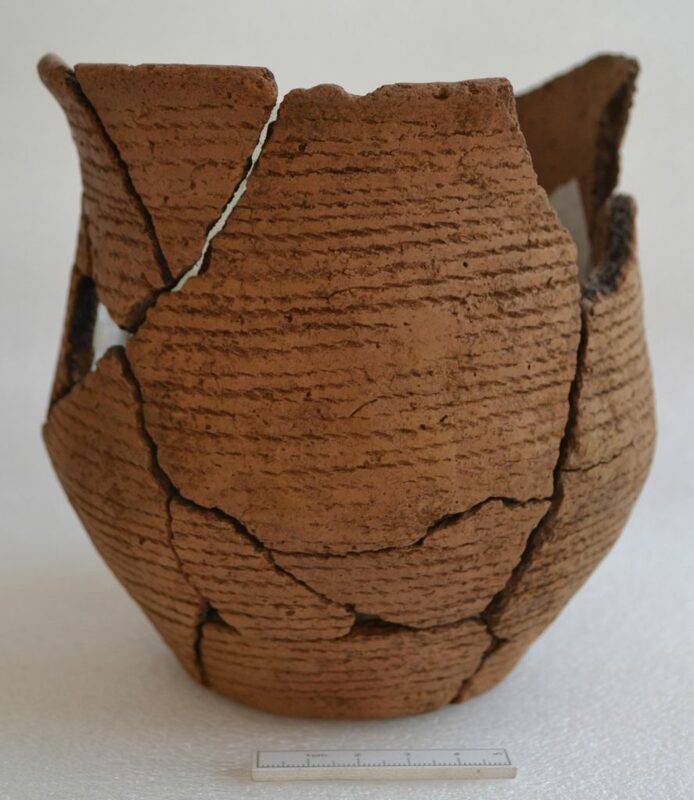 No complete pot survived but fragments tell us that some were finished with smoothed and polished (burnished) surfaces, while others had deliberate finger rilling (dragging the fingers down the neck of the vessel) to form a textured pattern. Occasional holes, perhaps three to four piercing the pottery around the vessel below the rim show that some vessels were suspended over the fire rather than placed in the ashes of the hearth. Many of these pots were used for food preparation. Later Neolithic potters developed different shapes of vessels with simple rims, and decorated them with designs that were pressed into the clay – middle to late Neolithic Impressed Wares. The ends of twigs, bird bones, perhaps a flint blade, finger tips and finger nails were common tools used in decoration. The neck of vessels below the rim were decorated with designs that were horizontal, but lower down the pot the designs are more random. On some vessels, designs were created using bone and twigs, or fingernail and twig/blade, as in this example and the one above. By the end of the Neolithic and the beginning of the Bronze Age, 4500 years ago, the function of some pottery vessels changed and although pots continued to be used for domestic purposes, some were produced to hold the cremated remains of the dead. An almost complete Beaker vessel was reconstructed. Its horizontal design was made by a wool cord wound round the whole vessel and impressed into the clay. Another pot, a funerary urn had been distorted and broken in the pit in which it lay. 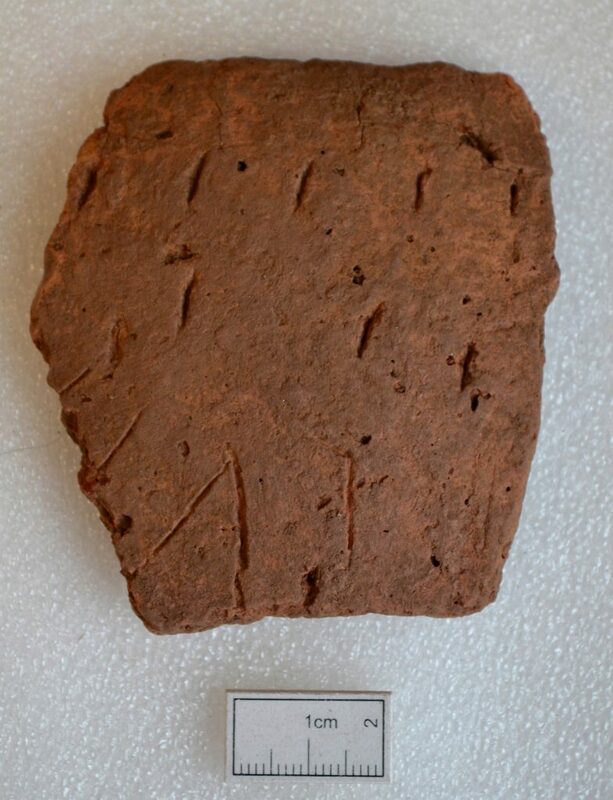 Note below the row of finger tip impressions decorating the pot below the rim. This entry was posted in Blog on March 28, 2019 by Author. 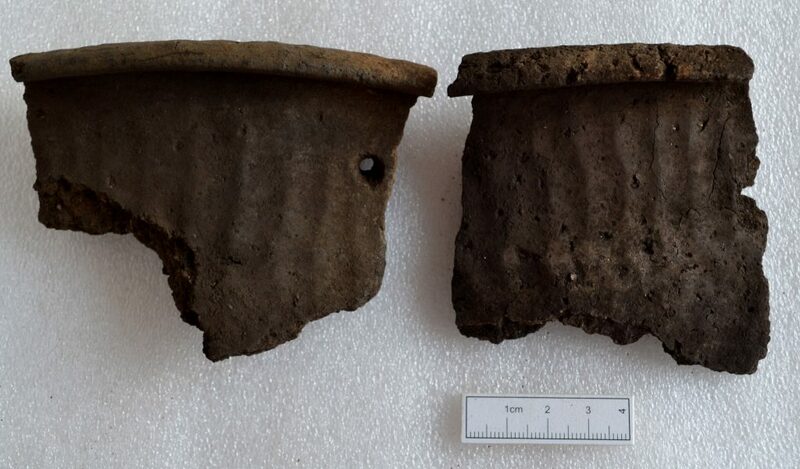 A clutch of radiocarbon dates ranging between around 1200 BC to 900 BC, were recovered from the structures clustered to the north-east of the Neolithic hall. This is where the pit containing the Late Bronze Age hoard (dated to 1118-924 BC) was found. Which indicates that the hoard was buried in the middle of a large contemporary settlement. Five circular or sub-circular houses were revealed during the excavation, from which these radiocarbon dates were extracted, though as these were found right at the eastern limit of the excavation, this village undoubtedly extended beyond (underneath the road leading to Carnoustie High School). So we have a remarkable archaeological context for the hoard. Analyses of the artefacts and ecofacts from this settlement will provide information about the lifestyle of the people who buried the hoard. Because the radiocarbon dates also revealed that the site was occupied sometime between around 700 to 1000 AD during the early medieval period. These dates came from features across the central eastern part of the site and while the only structure that we can just now confidently date to this period is a curious linear stone structure which yielded a radiocarbon date of 769-888 AD; this evidence clearly demonstrates that there was a Pictish settlement here too. Which was not expected! This entry was posted in Blog on February 28, 2019 by Author. 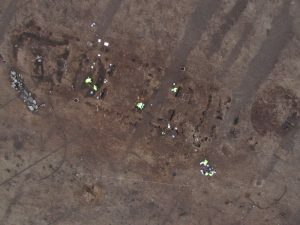 So now that we have radiocarbon dating evidence for Early-Mid Neolithic occupation of the larger rectilinear hall (Structure 8) at Carnoustie, what does the latest batch of radiocarbon dates tell us about the context of this settlement? The other large rectilinear hall (Structure 13) which lies just to the south-west of the larger hall has yielded calibrated radiocarbon dates ranging between 3938-3033 BC, which indicates that it was contemporary with the larger hall and may even have carried on after the larger hall was abandoned. But perhaps the most surprising aspect to be revealed by the latest batch of radiocarbon dates is that many of the other features have yielded Neolithic dates too. 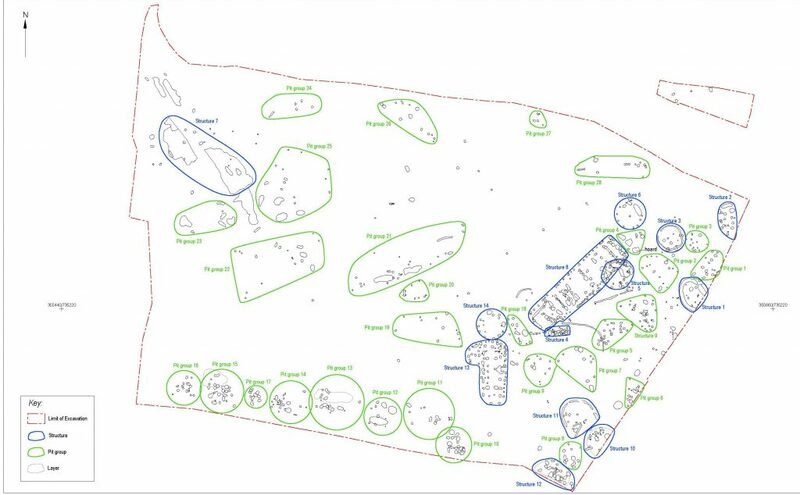 These include structures 10 and 12 that extend beyond the southern corner of the site and the numerous groups of pits that lie to the east and south west of the two Neolithic halls, which have produced calibrated radiocarbon dates from across the fourth millennium BC. So it is clear that the two Neolithic halls lay within a much bigger settlement area. This entry was posted in Blog on February 1, 2019 by Author. So far, we have received three radiocarbon dates from the larger Neolithic hall (Structure 8) at Carnoustie. Three of the post-holes at the north-eastern gable end of the hall have yielded calibrated (2 sigma) dates from single entity samples (willow, alder and hazel) of 3694-3530 BC, 3929-3703 BC and 3893-3653 BC. Which confirms our assumption that this was an Early Neolithic structure of the early fourth millennium BC. Those dates are really close to the radiocarbon dates recovered from other Neolithic halls in Scotland such as Balbridie in Aberdeenshire and Doon Hill in East Lothian. So it’ll be interesting to see whether the smaller building (Structure 13) at Carnoustie, which lies on different alignment south of the larger hall, yields a different range of radiocarbon dates. This entry was posted in Blog on December 20, 2018 by Author. The first batch of radiocarbon dates have come back with some interesting results. First of all a couple of occupation layers within Structure 5 (a roundhouse just to the south of the pit containing the Late Bronze Age hoard) have yielded calibrated radiocarbon dates of 1118-931 BC and 1082-905 BC. These dates are very close if not pretty much identical to the calibrated radiocarbon date of 1118-924 BC obtained from the wooden scabbard of the Carnoustie sword. So this confirms that the hoard was buried within a pit that lay within a contemporary Late Bronze Age settlement. Another question is whether this settlement just comprised the one roundhouse or whether at least some of the other apparent buildings and houses were contemporary with this. Well, another building, Structure 1, which is elliptical in shape and lies to just to the east of Structure 5, yielded calibrated radiocarbon dates of 1046-916 BC and 920-818 BC. Structure 2, a sub-circular structure to the north of Structure 1, yielded calibrated radiocarbon dates of 1084-912 BC and 1192-998 BC. Structure 3, another roundhouse which lies just to the east of the hoard pit yielded a calibrated radiocarbon date of 1207-1017 BC. Altogether, these radiocarbon dates provide a context for the burial of the Carnoustie hoard. The dates suggest that the hoard was buried within a pit that lay within a large settlement that had developed over the course of the last couple of centuries of the second millennium BC and on into the first couple of centuries of the first millennium BC – ie the Late Bronze Age. Which is very exciting. And we haven’t yet mentioned the radiocarbon dates for the earlier Neolithic Hall! This entry was posted in Blog on November 30, 2018 by Author. 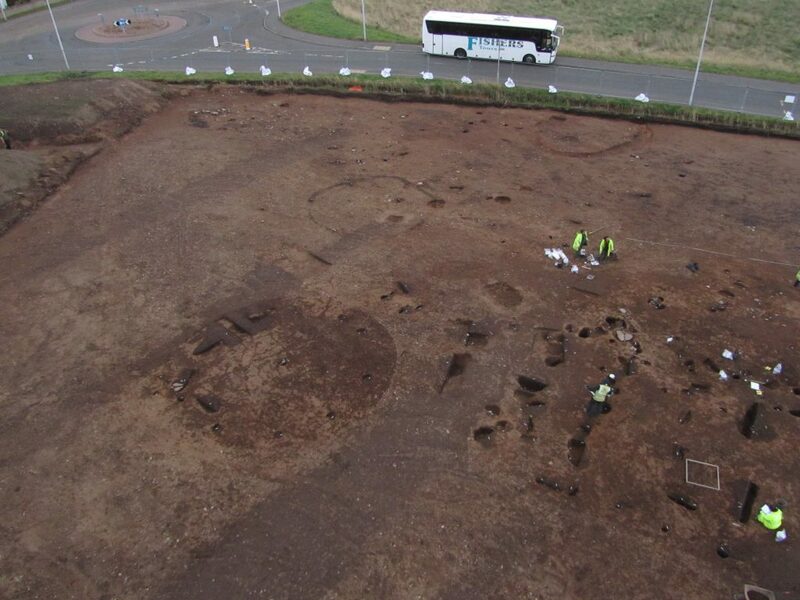 Although the museum where the excavation assemblage will be eventually exhibited has yet to be determined, Angus Council are keen to be proactive in the presentation of these important finds within the Angus area. 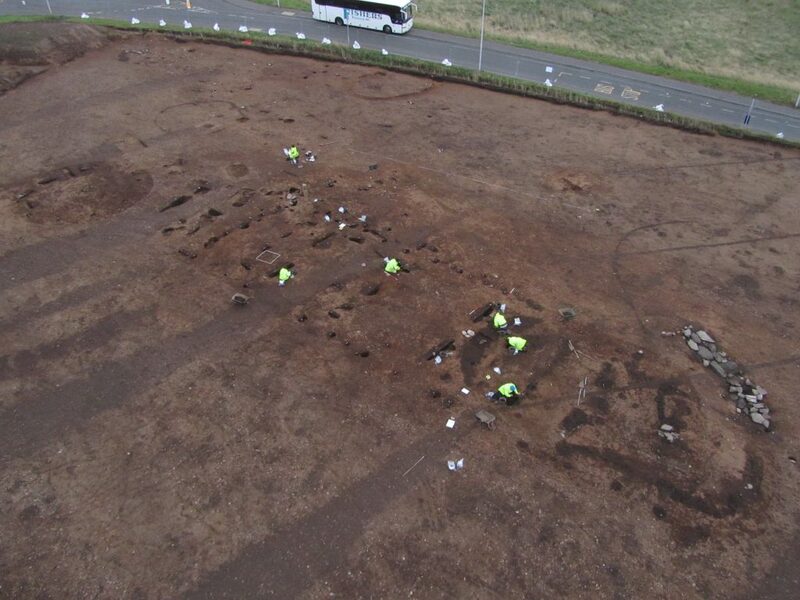 To this end the programme of post-excavation works includes the production of replica items from the Bronze Age Carnoustie hoard discovered at the site, which will be suitable for public display and educational purposes. It will be possible for all items to be handled by children and adults, under supervision. 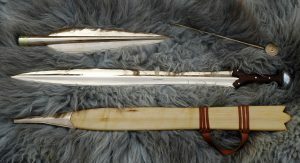 The replica spearhead, sword and pin were cast and finished at a scale of 1:1 by Neil Burridge, a Bronze Age metalwork expert who has provided similar items for display and reenactment purposes across Britain for over 12 years (http://www.bronze-age-swords.com). Neil also produced a scabbard for the sword. Neil was provided with scale illustrations of the sword and spear prepared by GUARD Archaeology’s Senior Graphic Officer, Gillian Sneddon. 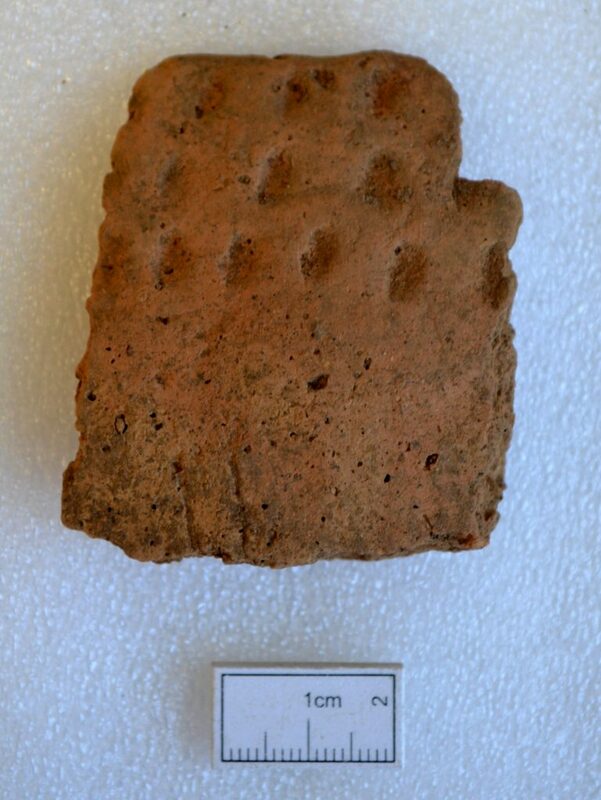 This ensured that the replica objects are an accurate representation of the items discovered at Carnoustie. The items were cast in bronze, and the sword hilted in a similar material to that found in the hoard. The golden collar on the spearhead was replicated in design and form with a gold coloured base metal. This entry was posted in Blog on October 31, 2018 by Author. This fragment of a cannel coal or shale bangle is an example of a Late Bronze Age item of jewellery that was comparatively rare in Scotland and which could well be contemporary with the hoard of metalwork found just around 5 m away. The recurrent association of such bangles with other valuable items including metalwork suggests that they formed part of the ‘vocabulary of esteem’ among the elite of Late Bronze Age society. 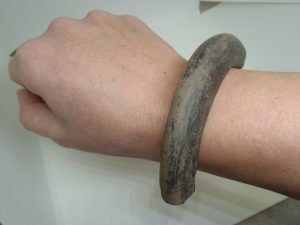 It is hard to tell whether locally-available cannel coal or oil shale had been used to manufacture this bangle, since sourcing these particular materials requires sampling of the object. However, there are abundant supplies of cannel coal in the coalfield deposits of Fife, and shale is also available within a few kilometres of Carnoustie, so in theory this need not have been an exotic import. 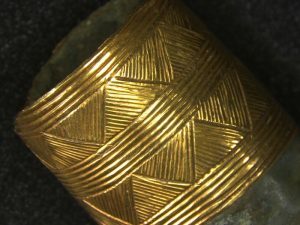 While Late Bronze Age bangles are likely to have been made by specialists, the scale of production in northern Britain may not have been large, to judge from their rarity. As for how the bangle had been made, there are two basic methods: the first involves pecking or gouging a hole in the centre of a roughout then expanding the hole by cutting, and the second involves cutting a disc from the centre, leaving a disc-shaped waster or ‘core’, usually with a bevelled edge (from where the disc had been cut from either side of the roughout). The latter technique, rare in Scotland, is characteristic of Iron Age and early medieval bangles, and no pre-Iron Age example of a disc-shaped waster is known. 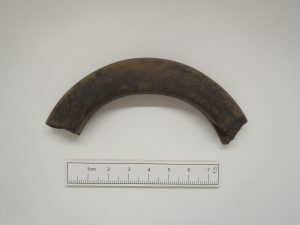 This suggests that the Carnoustie bangle had probably been made by expanding a small central hole; the cut-marks running around the interior of the hoop are consistent with this. This entry was posted in Blog on October 2, 2018 by Author. Buried within one of a row of pits within the large Neolithic hall at Carnoustie was a complete axehead in pristine condition, quite possibly never used. 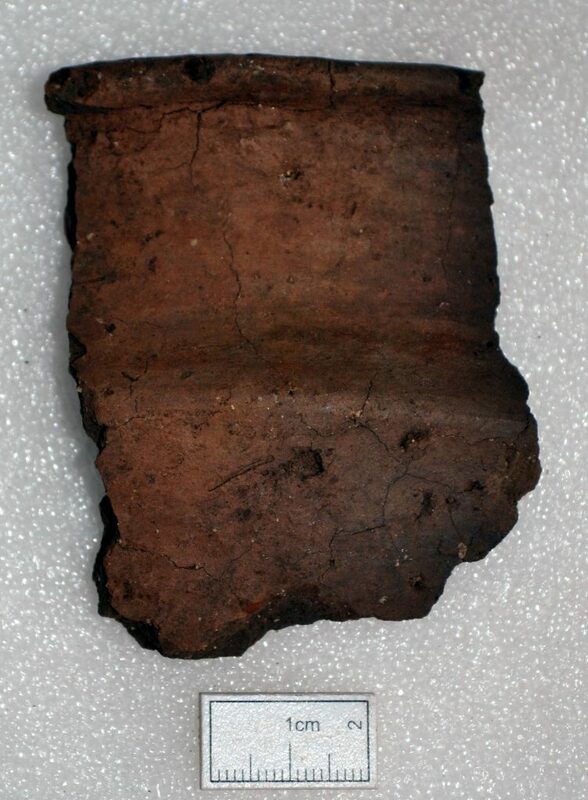 Measuring 170 mm long and 63.5 mm wide, this was analysed by Alison Sheridan from National Museums Scotland. With one face more markedly convex than the other (the blade lies closer to the less convex face), in theory this could have been hafted as an adze-head instead of an axehead, although it lacks the marked longitudinal asymmetry of adze-heads. There are numerous shallow striations all over the surface, from its grinding smooth and polishing to a low sheen. There is no obvious haft stain, and in any case the position of the axehead in the pit indicates that it was unhafted when deposited. The stone has kindly been identified by Dr Peder Aspen (former curator of the Cockburn Geological Museum at the University of Edinburgh) as a garnet-albite-schist, a metamorphic rock originating in the Highlands. Stone axeheads were an essential tool of farming communities, and many will have been required in the construction of the large Early Neolithic timber buildings at Carnoustie. 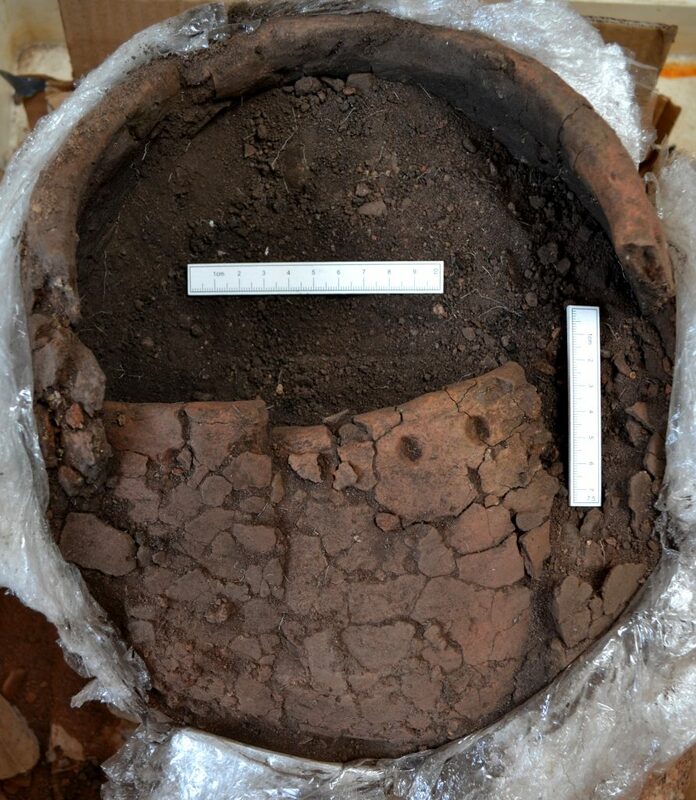 It is possible that the deposition of what appears to be an unused axehead in a pit was a symbolically-significant act for the Early Neolithic household here. This entry was posted in Blog on September 7, 2018 by Author. 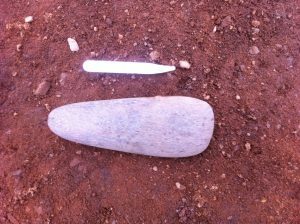 The Carnoustie spearhead was probably the star find of the dig. But it’s not the only gold decorated bronze spearhead to be found in this part of Scotland. Another Bronze Age hoard was recovered at Pyotdykes farm just outside Dundee in 1963 and it too includes a gold decorated bronze spearhead. Indeed the discovery of the Carnoustie hoard spurred one of the specialists involved in our post-excavation programme of works, Alison Sheridan of the National Museums of Scotland to re-examine the Pyotdykes artefacts – two swords and the spearhead – which are held by The McManus – Dundee’s Art Gallery and Museum. The Pyotdykes band has a more elaborate scheme featuring filled triangles between zones of up to seven lines. In each case, the design was probably incised into the end of the bronze socket, and then a seamless hoop of thin gold foil was slipped over the end and pressed in, to take the design. One of the Pyotdykes swords had been buried in a scabbard made from hazelwood, just as the Carnoustie sword had been. As with the Carnoustie hoard, this proved really useful in providing suitable material for radiocarbon dating. The Pyotdykes hoard is now dated to 900–790 BC, slightly later than the Carnoustie Hoard which was dated to between 1118-924 BC. The dates are interesting because they suggest that the two hoards were probably not contemporary with each other but may have been separated in time by as much as 300 years. This makes the similarities between the hoards all the more fascinating because while these suggest a similar idea behind why they were buried – perhaps safe-keeping rather than ritual given that the Carnoustie hoard lies within the middle of a settlement unlike most hoards which were deposited in watery places (rivers, bogs, lochs) – it was not one event that spurred this. This cultural custom of burying precious possessions for safe-keeping (for whatever reasons) was probably practised in this region for several centuries in the Late Bronze Age. And for whatever reasons, those who buried the hoards at Carnoustie and Pyotdykes, never returned to reclaim them. This entry was posted in Blog on July 31, 2018 by Author. 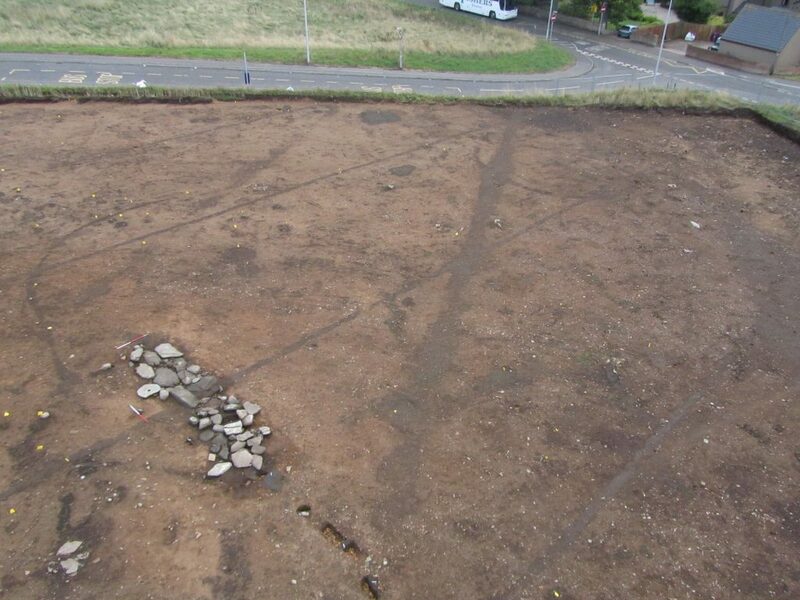 Earlier in June a team of GUARD Archaeologists made a visit to Carnoustie High School, which lies adjacent to the archaeological site. Approximately 22 students had been selected by the school for some archaeological workshops. An initial presentation by the excavation director provided an overview of the project from the initial evaluation, through the excavation, and into the post-excavation process, which is the stage we are at the moment. After the talk, the school students were split into two groups, one for drawing artefacts and one for photography, with each workshop led by GUARD Archaeology’s Graphics Officers. 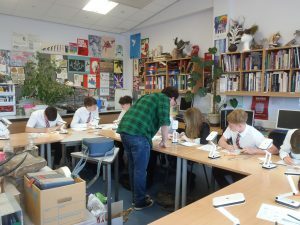 During the Artefacts Illustration workshop, the students were shown a selection of finds from Carnoustie (prehistoric stone tools, lithics and pottery) and were then asked to select one that they would like to draw. They then learned how to draw different types of artefacts by drawing around it then using dividers to measure and correct the outline. They also used a magnifier to add in detail and were given a small light to create a light source for shading. Once they had finished the pencil drawing they traced over it using fibre tipped pens to produce a final drawing. For the Artefacts Photography workshop, the students took pictures of prehistoric stone tools and pottery using either a portable light box or portable desk lights. They learned how to use photo scales and also how lighting can emphasise detail of an object. 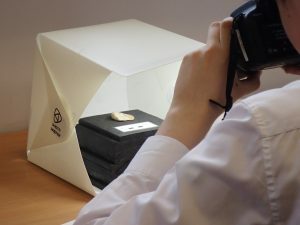 The students were also taught how to use a digital SLR camera to achieve best results for close up images of artefacts under different lighting. These workshops will be followed up with a second day in Autumn 2018 which will examine more of the results from the post-excavation analyses and the science behind each specialism. This entry was posted in Blog on July 5, 2018 by Author.